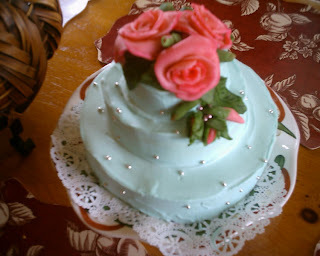 Cinderella Moments: I Love Making Cakes!!! This one was for New Years. The mistletoe is made out of marzipan. It's very sticky to work with, but so worth it when you taste it! For the cream, I like Italian cream. Marzipan roses are just like making paper roses. More marzipan! This was for my little sister Sophie's birthday party. She was so into panseys!